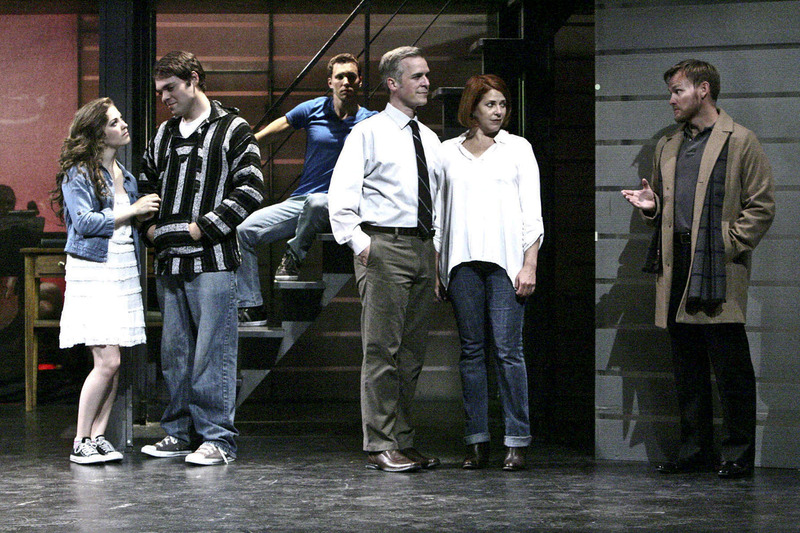 In 2008, Writer-Lyricist Brian Yorkey and Composer Tom Kitt gave theater-goers everywhere the prescription for a bold new musical centering around a suburban housewife and mother struggling with the often devastating effects of bi-polar disorder and the subsequent consequences it plays out on her loved ones. Not exactly material likely to inspire such light-hearted ditties as “On The Street Where You Live” or “Tomorrow”, but the team have succeeded magnificently regardless! 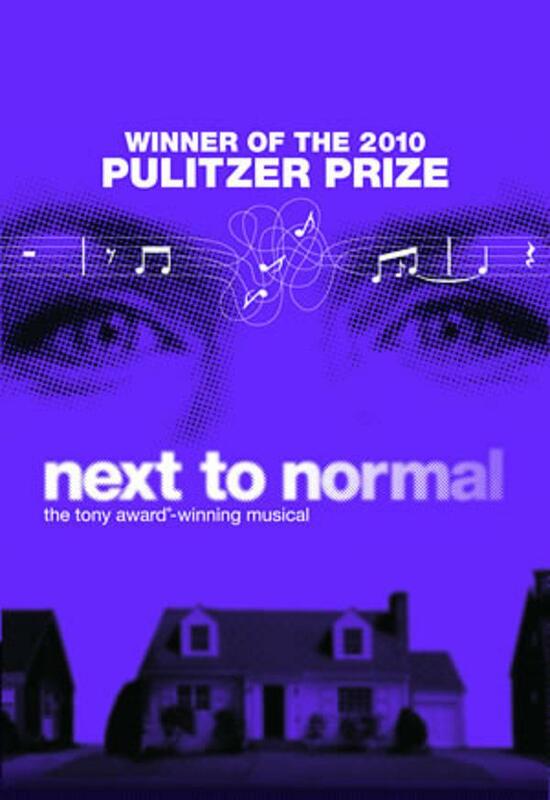 The winner of three 2009 Tony Awards (including for “Best Original Score“), it next won the 2010 Pulitzer Prize for drama–one of the few Musicals ever to achieve this honor. Then again, few musicals are as impactful as this. Now this momentous production makes its regional debut at Southern California’s “La Mirada Theatre For The Performing Arts” in La Mirada California as the final offering of their 2012-2013 season. “Make up your mind to explore yourself. Make up your mind you have stories to tell.” Dr Madden (Keith Bearden) consults with Diana & Dan, while Natalie, Henry & “Gabe” look on. Produced by McCoy-Rigby Entertainment in conjunction with “The La Mirada Theatre For The Performing Arts“, the basic tenet of “Next To Normal” asks: is it preferable to live and suffer with (to the degree of mental impairment) some of life’s most excruciating memories, or to purge oneself of these even if it meant eradicating all the joyful or most treasured ones as well. This is not so much a “Feel Good” musical as it is one that dares audiences to “feel”. Pretty intense stuff to be sure–but still it manages to be illuminating, entertaining and even funny at turns, and these are the amenities that La Mirada’s production has in spades. The story itself is nearly completely sung through, only interrupted by very brief sections of dialogue, which seems strangely suitable given the heightened mix of mundane reality and manic sur-reality presented; However, don’t think of Kitt and Yorkey’s contemporary score as a “Popera”(–a better term would be a “Pill-Popera:”!) Yorkey’s lyrics are deeply astute and expressive, conveying the profoundest emotions and intimate truths concerning what repercussions even the most benign medications can have on a troubled mind. These aren’t so much musical-numbers as they are bona-fide arias–moving the plot along but also affording each of the six characters plenty of opportunities to impart their innermost thoughts and sentiments. By the time the final notes are sounded and sung, viewers are left with, maybe not your traditional “Happy” ending, but (depending on your outlook) a “Hopeful” one instead. Bets Malone is Diana, a woman “living on a prayer and a latte”, from whose somewhat dubious frame of reference the story unfolds (–in one of the more ingenious twists this or any show has employed, we eventually discover that, in view of her condition, things aren’t always what we’re led to believe!) Equal parts sarcasm, vulnerability, defiance and frailty, Diana is a ’tour-de-force’ role and Malone delivers a tour-de-force’ performance in a cast filled with them! Gifted with a remarkable talent for empathy, She effectively had every member of opening night’s audience right with her every step of the incredible journey she was taking them on. Vocally, she captivated listeners with the poignant “I Miss The Mountains“ and “The Song Of Forgetting“. Tessa Grady also does an amazing job carrying the show’s ‘subplot” as her tightly-wound, obsessively over-achieving daughter, Natalie. Anyone familiar with Ms. Grady’s work already knows what a cracker-jack performer she is–with this, she handily proves she’s a dynamic actress as well (actually, all the roles here seem to entail serious acting with notes on top!) She practically brings down the house with “Superboy and the Invisible Girl” in which Natalie details what its been like constantly living in the shadow of a memory. In what might be more of a feminist fantasy than fact, all the guys depicted are infinitely patient (or, as Diana puts it, “strong, stoic and stalwart”) always there, always true to their vows and staying the course come what may. As Diana’s husband Dan, Robert J. Townsend also boasts a great deal of empathetic charm and relatability, lamenting at one point, still another crazy-but-wonderful certainty: “Love is insane”; meanwhile, spectators will definitely find much to connect with in Alex Mendoza’s portrayal of Henry– Natalie’s part stoner, part nebbish, all genuinely likeable beau. Henry is the kind of dream boyfriend every girl wishes she had–and one which Natalie desperately needs. Thrillingly, as a pair Mendoza and Grady have terrific on-stage chemistry. Eddie Egan too impressively embodies the solid “All American” son and brother, “Gabriel” who may or may not be there. Real or otherwise though, his Gabe is very much an active presence that influences all of their lives. Egan’s act one assertion “I’m Alive” verifies how potent and passionate a singer he is; his handling of “There’s A World” shortly after, demonstrates how seductive–even sinister–he can likewise be. 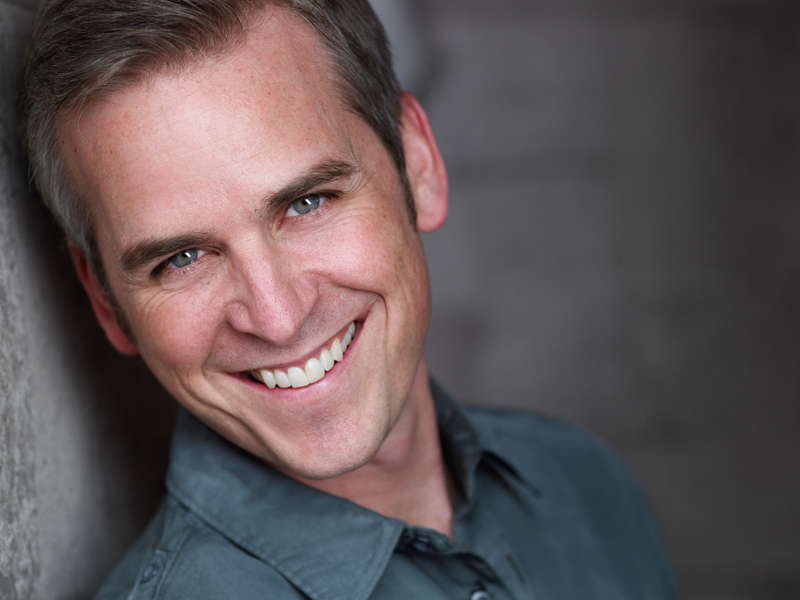 Rounding out the cast, Keith Bearden also does a laudable job making an impact with what could be an otherwise overlooked part as Diana’s “Rock Star’ of a therapist, Dr. Madden. Nick DeGruccio’s direction keeps things smooth and always in motion. Being a small cast musical there are no big choruses or impressive scene changes to fill in any gaps in the action; everything takes place on the single split-level set which doubles for several locations. John Ezell’s neo-suburban set design, which relies largely on silhouettes and outlines, physically personifies the idea of the “American Dream” half-lived, as if the inhabitants are only ‘going through the motions” semi-conscious of their surroundings–both externally and internally. Steven Young’s evocative lighting design doesn’t just compliment Ebell’s set–it fundamentally supplements it! Painting the rear cyclorama in a spectrum of ever-changing hues, color subliminally mirrors the lead character’s moods from cheery yellows and oranges to gloomy purple, with a few quick jolts of jarring white even thrown in. In fact, lights and set are so interconnected it would be hard to imagine one without the other! 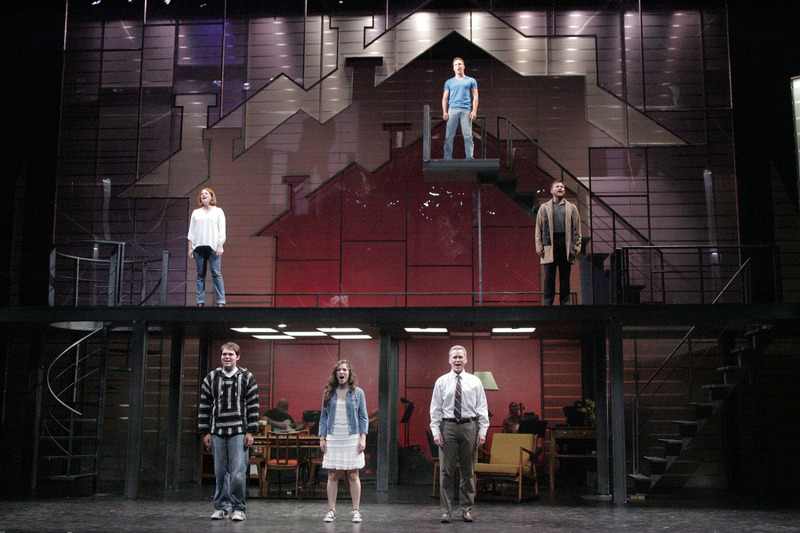 More than merely ‘outstanding‘, “Next To Normal” is downright ‘astounding’! Having opened on Friday, May 30th, it plays thorough Sunday June 23. ShowTime’s are 7:30pm on Wednesdays & Thursdays; 8pm on Fridays; 2pm and 8pm on Saturdays; and 2pm on Sundays. Special “Talkbacks” with the actors after the final curtain will be held on Wednesday, June 5 and Wednesday, June 19. Tickets are available on-line at: www.lamiradatheatre.com , or by calling the La Mirada Theatre Box Office at (562) 944-9801 or (714) 994-6310. (Student, Senior and group discounts are available.) “The La Mirada Theatre For The Performing Arts” is located at 14900 La Mirada Boulevard in La Mirada (near the intersection of Rosecrans Avenue, where the 91 and 5 freeways come together.) Diagnosis: All talk of “break-downs“ aside, this one’s a real break-through! Chalk up another tremendous theatrical accomplishment for McCoy-Rigby Entertainment. Suggested Treatment: See it as soon as possible! Production Stills By Michael Lamont, Courtesy of David Elzer And Demand P.R. (www.DemandPR.com) Special Thanks To David Elzer, Tom McCoy & McCoy-Rigby Entertainment (www.McCoyRigby.com) The Staff Of “The “La Mirada Theatre For The Performing Arts” (www.LaMiradaTheatre.com) And To The Cast & Crew Of “The La Mirada Theatre For The Performing Arts”/McCoy-Rigby Entertainment’s Production Of “Next To Normal” For making this story possible. This entry was posted in Theater reviews and tagged "Next To Normal", 2009 Tony Award Winners, 2010 Pulitzer Prize Winner, 2013 Southern California Theater Season, Alex Mendoza, Bets Malone, Brian Yorkey, Eddie Egan, Keith Bearden, La Mirada Ca., La Mirada Theatre For The Performing Arts, McCoy-Rigby Entertainment, Pop musicals, Pulitzer Prize Winning Musicals, Robert J. Townsend, Rock Musicals, Southern California Theaters, Tessa Grady, Tom Kitt, Tony Award Winning Musicals. Bookmark the permalink. Here is my friend Carly Ozard singing I MISS THE MOUNTAINS from Next To Normal. I love this song and her rendition.